I am a huge fan of art. I cover my walls with it at home, and I’m constantly looking for new pieces. I just can’t get enough. 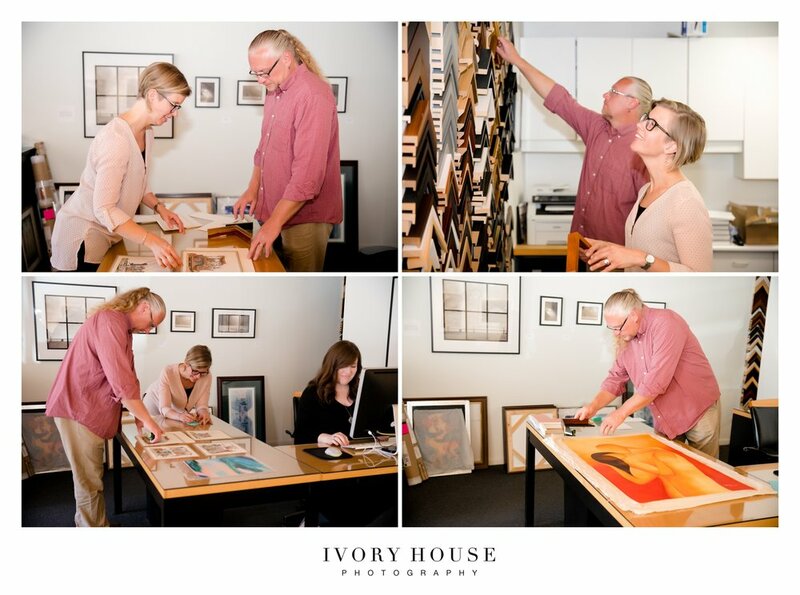 A few weeks ago, I stopped by Olson-Larsen Galleries in Valley Junction to chat with owner Susan Watts about our mutual love of all kinds of artwork, as well as the importance of framing your pieces. The gallery’s storefront on the main drag in Valley Junction attracts the attention of people walking by. The large windows offer a peek directly into their gorgeous gallery space, filled with an ever-changing display of the work of various Midwestern artists. The building has been an art gallery since 1970, but today it also boasts a custom framing shop. The “small but mighty” team from left to right: Mark Goodrich, Frame Shop Manager, Susan Watts, Owner, Alyss Vernon, Gallery Manager. Owner Susan Watts bought the business in 2010 from Marlene Olson, who had started it with Ann Larson back in the 70s. Susan had been a manager for seven years at that point, so she already knew what it would take to grow both the gallery and the framing side of the business as a staple in the Valley Junction commercial community. “Even though I was very familiar with the day-to-day things, the clients, and the artists, I was now the one making the final decisions. The buck stopped with me.” Susan and her “small but mighty” team work together to engage their clientele and keep their offerings fresh and accessible. Because of their location, Olson-Larsen gets a lot of pedestrian business who are curious about their collections. The gallery features regional contemporary artists with whom Susan and her staff establish formal relationships, offering contracts and representation to benefit both sides. They love the fact that these artists can easily travel to Des Moines to attend their openings and engage with people. In addition to the gallery, they also have an alternative exhibition space to show off things like installations and sculptures. On both the gallery and framing sides, Olson-Larsen caters to a wide range of clients, from parents looking to frame their child’s artwork to corporate clients putting the final touches on a new office building. Their service-oriented business model is evident in the quality of products and the personal connections the staff establishes with many of their clients. “Building relationships is a huge part of the business,” Susan says. Some of their clients have been coming to Olson-Larsen longer than she’s worked there. Both the framing and gallery sides are highly individualized, she says. “It’s not like they’re going out to buy a sweater.” Purchasing something that speaks to you or choosing how to display a piece in a frame are deeply personal and subjective experiences, not to mention investments. Being able to understand each client’s desires and view the process from their perspective is something that the staff strives for. Susan also advises all of her clients not to discount the importance of quality framing for those valuable pieces. If you don’t choose top-quality archival materials to preserve that piece, then you’re missing out on a big part of that initial investment, she says. I worked with the meticulous Mark Goodrich to frame four very diverse new pieces of art I’d been itching to get up in my home. Each piece was considered both individually and within the context of the other art I already have in my house. I love working with professionals that have strong opinions and an eye for detail. This team had that in spades and I was able to relax and let the magic happen around me. The quality of the finished pieces is impeccable and they flow in my household so beautifully. I found this dynamic duo in a thrift shop in Kansas City. I had been wanting to add original paintings to my collection and I felt absolutely drawn to the bold colors and simple abstraction of the human experience created by a young Cuban artist. We chose to frame them in a simple dark wood frame, bringing all the focus to the vibrancy of the work. The second framed piece is four prints I cut out of a calendar I bought for $10 in Houston, TX. This isn’t expensive art. But I was drawn in by the colors, the intricacy of the line work and the subject matter. I’m a true believer that art doesn’t have to be found in a gallery. Beauty in art is assigned by the beholder, and I thought these prints were worth archival framing. Last but not least is this sweet little print I picked up during an Adore your Walls print sale. I love this concept of $50 prints signed by the artist and Adore your walls owner, Liz Lidgett is so faithful in uplifting local artists. I love the simplicity of the white matte and white frame, really drawing the eye into the color and movement of the print. This piece is thriving in its clean white frame and chill environment. 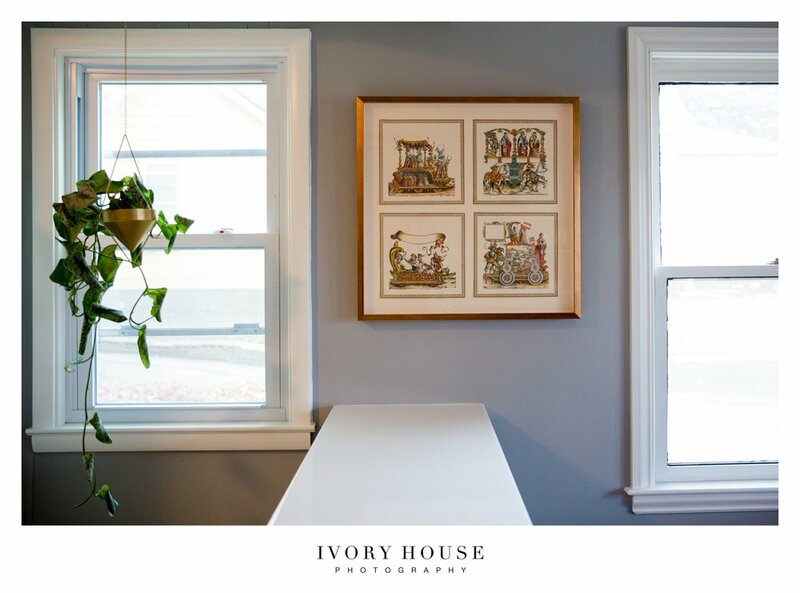 The frame snob in me is SO pleased with how these pieces add to my home. Now I’m on the hunt for more art, and more wall space!